A 1904 Renault Model U Type B 14/20HP Four-Cylinder Swing-Seat Tonneau sold for $340,000 as the top result at the 2016 Bonhams London to Brighton Run sale. Ten pre-1905 built veteran cars were sold at this classic car auction at the start of the weekend that celebrates the world’s longest running motoring race. A 1897 Daimler 4HP with Twin-Cylinder Rougemont Wagonette, the first Daimler built in the UK, sold for an impressive £236,700 ($294,000). A 1904 Aster 16/20HP, Four-Cylinder, Four-Seat Rear-Entrance Tonneau achieved £210,940 ($262,000). Bonhams annual London to Brighton Veteran Car Run Sale, held at 101 New Bond St on 4 November 2016 realized a total of £1.2 million, with starring lot the magnificent 1904 Renault Model U Type B 14/20HP Four-Cylinder, Swing-Seat Tonneau – sold to a European bidder in the room for £272,540. Now in its 13th year, the event saw 90% of lots sold, including ten pre-1905 built cars – the cut-off date for participating in the annual London to Brighton Veteran Car Run. This is the world’s longest running motoring event and had been held since 1896 when the first 60-mile run celebrated the increase of the national speed limit in the UK from 4 mph to 14 mph and scrapping the requirement that a man with a red flag must walk ahead of any motorized vehicle. Malcolm Barber, Bonhams Co-Chairman of Bonhams, said: “The traditional weekend opener to the Bonhams London to Brighton Run witnessed a packed saleroom, enthusiastic bidding and international interest. 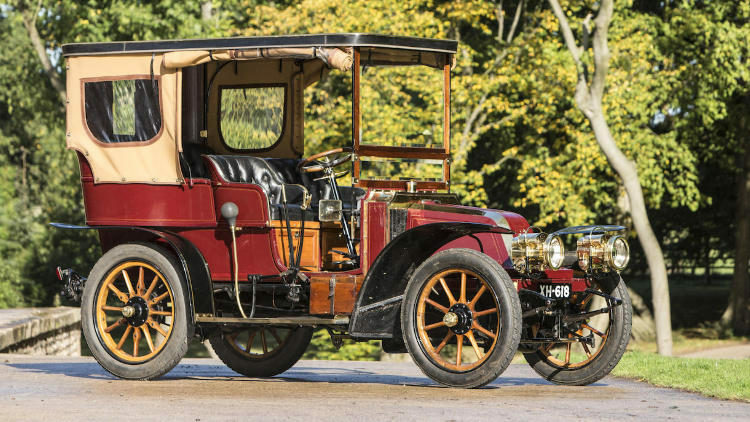 The top result at the 2016 Bonhams London to Brighton Run sale was £272,540 ($340,000) for a 1904 Renault Model U Type B 14/20HP Four-Cylinder Swing-Seat Tonneau. One of the first four-cylinder Renaults built, this Model U, Type B is powered by a four-cylinder side-valve engine of over 3-liter capacity and features the traditional Renault ‘coal scuttle’ bonnet with rear-mounted radiator and desirable swing-seat Tonneau coachwork. Owned by a French family from the 1920s, the car was bought by a UK-based Veteran Car Club (VCC) member in the 1980s and is now in the hands of a European veteran car enthusiast. The car has been rallied extensively in both the UK and continental Europe. Finished in red/black with black leather interior, it is offered with a VCC dating certificate and V5 registration document. Starting fourth in the run will be the historically important 1897 Daimler 4HP with Twin-Cylinder Rougemont Wagonette which sold for an impressive £236,700 ($294,000). A Brighton run veteran, this British-made Daimler cost £370 new. One of the few surviving machines of its type, it boasts flawlessly original condition, complete with primitive tiller steering. The handsome 1904 Aster 16/20HP, Four-Cylinder, Four-Seat Rear-Entrance Tonneau sold for £210,940 ($262,000). Extensively rallied, it was sold with its 1904 Yorkshire registration. This particular car has a fantastic history. It has participated in the Paris-Vienna Rally in 2002; an epic drive from Brisbane to Sydney, Australia in 2005; and the successful completion of the 1,000 Miles Trial Re-enactment in 2000. More recently, the Aster has taken part in the London to Brighton Veteran Car Run on five occasions (2011-2015) and has been described as one of the most practical Brighton cars. Further historic motor cars sold include the very rare example of a short-lived French make – the 1901 Decauville 8½HP, Twin-Cylinder and Four-Seat Rear-Entrance Tonneau which smashed through its estimate to sell for £149,340 ($185,500) and the 1903 Renault Type N-C 10HP, Two Cylinder 10HP Wagonette, previously owned by noted Renault collector George Dorrington which sold for £124,700 ($155,000). The Bonhams London to Brighton Sale celebrates the longest-running motoring event in the world; the London to Brighton Veteran Car Run which first took place in 1896. The sale is held on the Friday before the Run each year and features exclusively pre-1905 cars, each eligible for the historic Run.